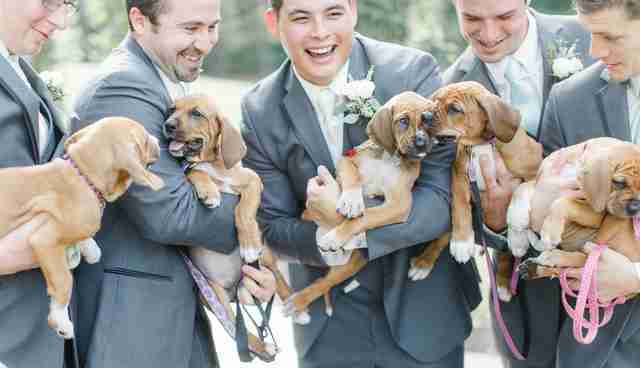 "The wedding party was loving all the puppy snuggles." When planning a wedding, there's a lot that has to be arranged. 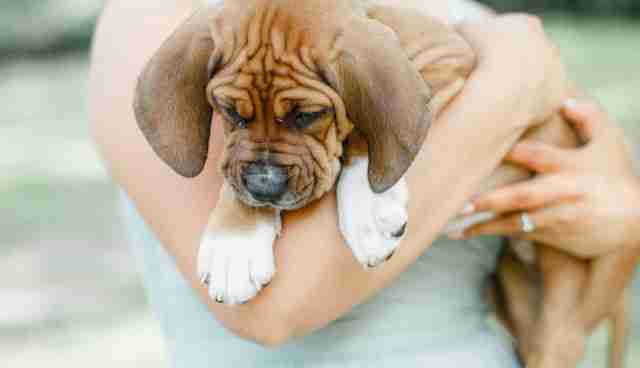 The flowers, the venue, the dress, the food - and for one wedding that took place recently, the puppies. Sarah Mallouk Crain works for Pitties Love Peace, a rescue organization in central Pennsylvania. She and her now husband, Matt Crain, are huge animal lovers and have three rescue dogs of their own, and often foster dogs waiting for their forever homes as well. When they decided to get married, it seemed only fitting that they should include their shared love of dogs on their big day. 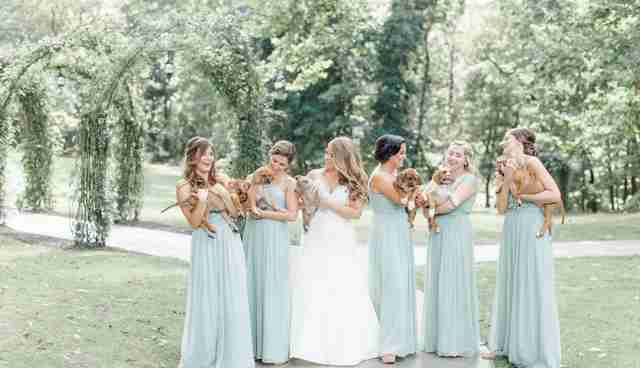 And so, in place of bouquets of flowers, the wedding party posed with adorable puppies. Photographer Caroline Logan photographed the wedding party with six tiny rescue puppies, each with their own unique story. 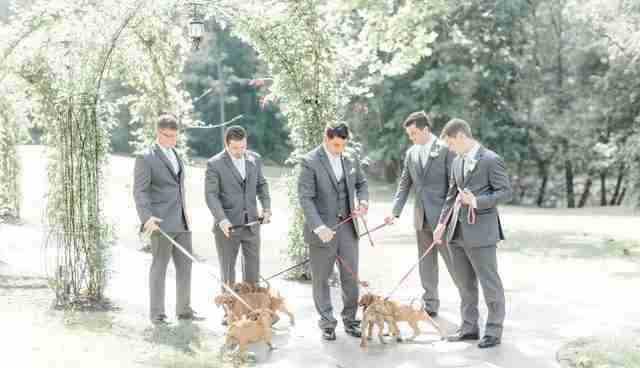 "Having the puppies involved in the wedding brought so much additional joy to Matt and Sarah's day," Logan told The Dodo. "Though they weren't a part of the ceremony, they were involved in their portrait time." Martha, Abigail, Dolley, Elizabeth and Louisa (named after the first few first ladies), are a litter of boxer-coonhound puppies who were rescued when they were just under a week old. They are now 8 weeks old and thriving in their loving foster homes, and absolutely loved posing with Crain's bridesmaids. 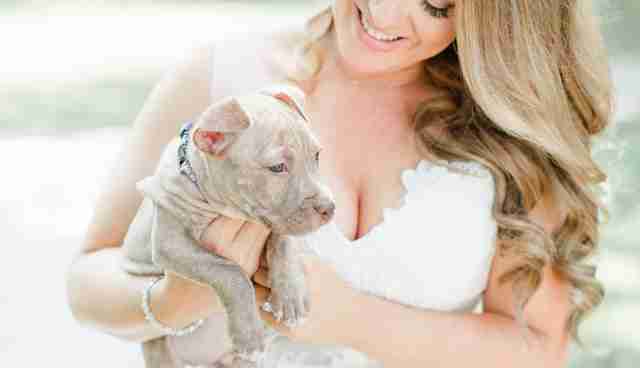 Biggie Smalls is a 9-week-old pit bull mix puppy rescued from the streets of Brooklyn, New York, and he was the lucky pup chosen to pose with the bride herself. "The puppies of course caused the photos to be extra natural, candid, and carefree - exactly what I strive for in my work," Logan said. 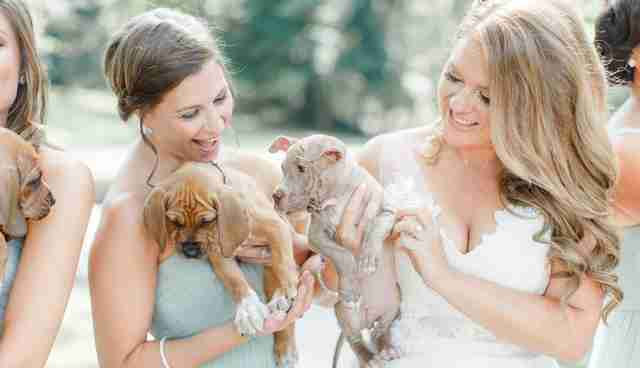 "The wedding party was loving all the puppy snuggles." ... and there was no shortage of smiles with the puppies around. 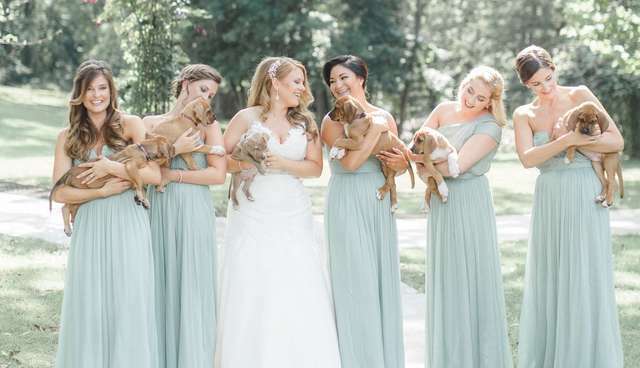 The puppies were all on their very best behavior for the wedding, and proved without a doubt that they were definitely a better choice than flowers. If you're interested in adopting one of the wedding puppies, you can fill out an application with Pitties Love Peace to get started.